The Making of Seamech | Seamech International, Inc. If you could select locations in America that would provide hot weather at its extremes, locations such as Death Valley, California and Phoenix, Arizona would probably come to mind. When hot weather testing is required, Seamech sends engineers and aircraft, with its prototype equipment installed, out into the field so that our products can experience some very hot weather extremes. We test in these conditions because our future customers will operate their aircraft in places such as Phoenix, Death Valley, Africa, the Middle East and the hot and humid jungles of Central America. In these conditions, we must ensure that our environmental systems function effectively, just as the customer expects. In this climate, a working day begins with engineers donning wide brim hats, applying sunscreen and ensuring that ice chests with water are easily accessible. Test aircraft have been parked outside, without a cover, to heat soak in ambient temperatures as high as 125 degrees Fahrenheit (52C). After the heat soaking is complete, buttons are pressed, electronics are operated and sensors are checked while engineers record data and take extensive notes on the performance of the environmental system. Once this exercise is complete, the aircraft is started up and the environmental system is set to cool the cabin. Data monitoring temperature sensors are installed to record multiple temperature locations such as evaporator inlet and outlet, ducting and forward and aft cold air outlets. At the same time that temperature data is being recorded, refrigerant pressure data and condenser temperatures are also being gathered. Throughout the following days and weeks, data is analyzed and specific tests are conducted according to Seamech’s detailed testing plan. Once this testing is complete, the aircraft is returned to Seamech’s testing base and work continues to resolve any issues. In the months that follow, the aircraft will be prepared for cold weather testing. Cold and hot weather testing are just a few of many tests Seamech engineers conduct in order to reach a common objective: top quality. Seamech International, Inc. will market, fabricate, and service products of such quality that they will reliably perform to their intended function. Through active top management involvement and continual improvement methodologies, Seamech International, Inc. will make every effort to provide parts and services that will consistently exceed the customer’s expectations. It is the intention to develop, implement and maintain a strong, customer-focused Quality Management System based on AS standards that are appropriate for our size and organization. Seamech is committed to customer satisfaction by meeting and exceeding customer expectations through teams working together to provide the highest quality products. Seamech’s QMS is designed and tailored to meet the applicable requirements of AS9100 & ISO 9001 guidelines, and all pertinent regulatory authorities. Seamech maintains a quality management system compliant to AS9100 and customer specific requirements. Safety and reliability analysis conducted on initial design activity to discover quality or life issues that may affect system long term operating costs. Hardware is selected or a design is promoted based on proven experience in similar aircraft, duty cycle, weight and performance goals. New technologies are rigorously tested to ensure they will meet design and operating requirements. When prototype designs are nearly complete, a final design review with Seamech and the customer ensures the product is ready for final testing and production development. The process of continually refining the design, at each developmental phase, results in producing a product that meets every requirement. Continuous improvement must be accounted for in all areas. From the moment a customer interfaces with our expertly designed controls, the quality presence of the product is recognized. Regarding Seamech’s latest refrigeration compressor pallet, Mike Harness, VP and General Manger, said, “Seamech’s development team along with the collaboration of industry leading motor, motor controller and thermal design engineers, has developed a direct drive refrigerant compressor system with a 28 volt DC brushless motor to solve both weight and performance related issues associated with legacy electrically driven compressor systems on aircraft. 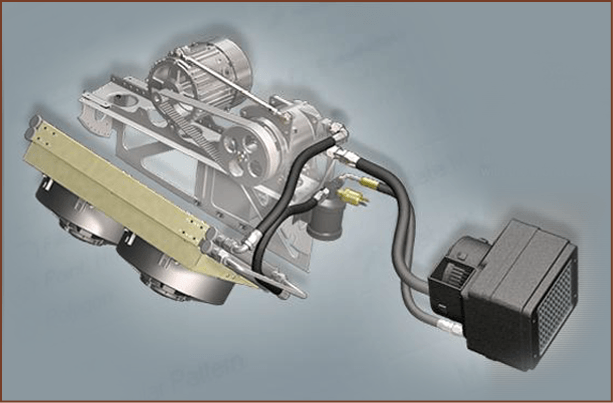 By using cutting edge motor and controller design solutions, Seamech was able to design a direct drive compressor system that saved over 14 pounds of weight compared to an existing refrigerant compressor installation, provided a motor with an efficiency rating exceeding 94% and allowed for active cooling of the motor controller to extend electronic component life”. Drue Nixon, Director of Engineering, remarked, “Seamech is about opportunities. I feel privileged to have had multiple opportunities to design environmental systems on a clean sheet of paper, with unanimous support from Seamech leadership”. Seamech has been committed, from the very beginning, to producing environmental systems and associated products that meet high standards of quality and performance. As the evolution continued, there was little doubt that to continue to work to that objective, a new manufacturing facility would need to be developed. The new facility has been carefully planned to produce high quality products and to be with flexibility across multiple platforms. Seamech’s manufacturing and logistics processes are designed to produce the highest quality of products. The first step to developing a high quality product is to start with the optimal concept. Seamech’s engineers work together with their suppliers to design environmental systems with consistent high quality. Seamech’s manufacturing approach is focused on repeatedly producing products at an efficient low cost rate. Quality processes are continually monitored and any issues are immediately resolved. In the work-cells, in-line quality checks using “Quality Gates” are used for the early detection of deviations from Seamech’s quality standards. If a deviation is identified and cannot be immediately eliminated, production on the associated component is consequently halted until the issue is found and resolved. It is this attention to detail that is fundamental to Seamech in order to produce quality components that meet the expectations of the customer. The inventory component of Seamech’s approach to achieving quality products is the close cooperation with suppliers. Our director of quality works with suppliers in the preparation, introduction and supply of our parts. Some of the critical subassemblies, such as wiring harnesses or electronic modules are pre-assembled and tested at the supplier’s facility. Seamech’s quality system includes provisions for regular inspection and auditing of suppliers’ facilities and quality systems. This allows rapid quality feedback and accelerated quality improvement. Seamech continues to adopt highly efficient principles along the production line. Within the business, this includes creating a flat hierarchy, more responsibility for each managerial level, continuous competence from bottom to top and improved internal and external communication. This same communication also extends to the way Seamech cooperates with its suppliers. From the earliest days, we recognized that a critical success factor is the integration of external suppliers as development and production partners. The definition of parts and systems specifications are undertaken in conjunction with, rather than being imposed upon, world-class suppliers such as Bosch, Tyco Electronics, Amphenol, Aeroquip, Goodyear, Parker Hanofin, Honeywell, Micronel and Molex. This means that their expert input and advice flows, largely unfiltered, into the equipment selection and the component optimization process. Embracing their experience and high quality technological developments, Seamech works closely with its suppliers to ensure that our current and future products will be able to compete effectively with rival products from other brands across every facet of design, engineering, development and production. Through extensive strategic outsourcing, Seamech has remained agile and lean, retaining a fixed cost base estimated to be less than many of our competitors. Seamech takes its responsibility for its employees very seriously and is committed to dedicated training and development programs for them. Employees are encouraged to complete development and certification courses to further their technical skills. The objectives of training include learning new skills, improving the employees’ practical capabilities as well as development of leadership skills. Each new employee embarks on a comprehensive in-house training program. This allows Seamech to create the right mind set, focusing on state-of-the-art LEAN principles right from the beginning. The program improves efficiency, motivation, safety and increases productivity. Each of these activities promotes and emphasizes Seamech’s strong commitment to the concept of quality, which is at the heart of our organization.